Leviton Decora® 5-Gang Standard size wallplate/faceplate in brown color, features thermoset plastic construction with smooth finish. It has smooth face and rounded edges to resist dust accumulation. It offers resistance to fading, discoloration, grease, oils, organic solvents and moisture scratches. 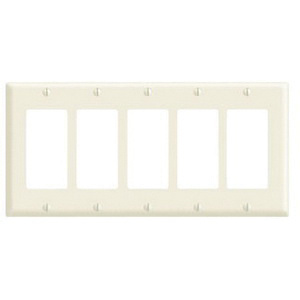 Rectangle wallplate/faceplate measures 10-Inch x 4.5-Inch x 0.220-Inch. Device mountable wallplate/faceplate with five decora/GFCI configuration, has 0.406-Inch x 0.942-Inch cutout. It comes with color-matched metal mounting screws. Wallplate/faceplate is UL listed and CSA certified.